He’s back and he’s ready to fight. 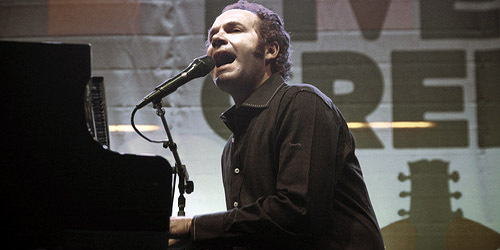 Five For Fighting, the one-man band formed by John Ondrasik, is back with a new single from his first album in four years. Although I appreciated most of his earlier single material from America Town and The Battle For Everything, it wasn’t until Two Lights in 2006 that something really struck me about Ondrasik’s storyteller style and crafty piano melodies that gave me the extra push to listen to his full albums and rank his singles highly on my chart. To date, he’s had three number-one songs on my chart, the most recent of them, “Chances”, in 2009. However, that three could soon turn to four with the release of his latest track that’s available on iTunes this Tuesday, a song called “What If”. The first single from Five For Fighting‘s forthcoming sixth studio album is able to mix together a couple of more recent musical identities, but stays true to the man himself. On first listen, I was instantly reminded of Gavin DeGraw‘s “Not Over You”, a poppier song with a heavy drum pattern, which is essentially what is happening here. We’ve heard it lately from fun. as well with Jeff Bhasker on the production side. There are handclaps too! Handclaps! The verses aren’t particularly notable on the song, which consist of four lines each, and “if you don’t get it, then you don’t get it.” (I’m not sure I do.) However, this one is all about the chorus, a self-reflective space where Ondrasik questions about identity and trading roles and places. Don’t get him wrong, this isn’t a song about science fiction, although I’m sure these are test tubes bubbling in his song laboratory in the basement. Yet, it’s thought-provoking. It makes you wonder, and it’s open-ended. It’s great when the songwriter challenges you to make your own decision, and this is exactly what he does while he’s plugging away at the piano. It’s consistent, yet it’s a pinch different, and if Ondrasik is going to have to adapt his sound, this was certainly the best direction to do it in. Unfortunately for Ondrasik, age and radio sometimes don’t mix well. Although his core formats are still pretty accepting of acts over age 40 (he’s 48 now), it’s still probably going to weigh heavily in terms of programming decisions, especially with stations targeting a younger demographic in the AC and Hot AC formats. Plus, with a history of softer singles, you’re probably not going to find it next to a Ke$ha or Rihanna dance track. That being said, Wind-Up Records is giving his latest project a good time cushion with the single out now, an adds date at AAA radio on July 22, and an album release on September 17. It sounds like they’re going to really try to get Ondrasik’s presence back on the airwaves beyond the odd spin of “Superman (It’s Not Easy)” or “100 Years”. We do need some more piano-based rock on the format. For now, I’ll say that it goes top ten on AC, just in or below the top 20 on Hot AC and if they’re really going to push it at AAA, top 30. I sort of have to be conservative with these predictions no matter how much I like the song; that’s just the way radio goes, but I’m rooting for him as always. Enjoy the song and let me know what you think below or on Twitter: @AdamFSoybel. What if I had your heart? What if you wore my scars? How would we break down? What if you were me and what if I were you? What if you told my lies? What if I cried with your eyes? Could anyone keep us down? What if I were you? What if I told your lies? What if you cried with my eyes? What if your hand was my hand? Could they hold on or let go? What if your life was my life? Could they love what we don’t know? Could we hold on or let go? And what if I were you?